PORAC officers attend the grand opening ceremony. From left are Anthony Sanders, Barry Donelan, Tim Caughron, President Brian Marvel, Marshall McClain, Marcelo Blanco, Grant Ward, Bob Bonsall and Tony Bolanos. All are Executive Committee members with the exception of Ward, who’s director-at-large, SEBA, and Bonsall, who’s corporate counsel. 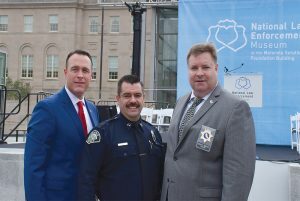 Nearly 20 years after Congress authorized the National Law Enforcement Museum, the first museum dedicated to all aspects of American law enforcement opened in Washington, D.C. PORAC, a major sponsor of the museum, was among the hundreds of people who attended the grand opening October 11. They included past and present law enforcement members from all over the country, community members, the public, dignitaries and celebrities. PORAC Vice President Brent Meyer, Treasurer Blanco and President Marvel. The museum is next to the National Law Enforcement Officers Memorial in Judiciary Square, blocks from the National Mall. 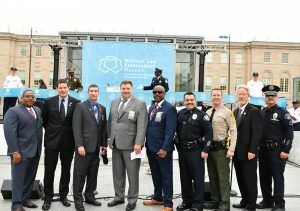 “Our goal is for every museum visitor to leave with a better understanding of the vital role that law enforcement plays in our society and they will hopefully realize that public safety is a shared responsibility,” said Craig Floyd, founding CEO of the National Law Enforcement Officers Memorial Fund. “Law enforcement needs to know they must work constantly to earn the support and respect of the communities they serve.